Just around the headland from Garie Beach in Royal National Park, is the quirky cabin community of Little Garie. It's one of four shack communities in the park. Built by families mainly in the first half of the 20th Century – before this area officially became part of the park – they're a fascinating piece of local history. This is Stop 8 on the Royal National Park Coastal Track Map. Starting from Bundeena on the two-day Coast Track walk, you would walk through parts of the Little Garie cabin community on the afternoon of the first day, before the North Era campground. Here's a sneak peek inside this unique cabin community just around the corner from Garie Beach. Everything you see had to be carried in by hand down a steep bush track. 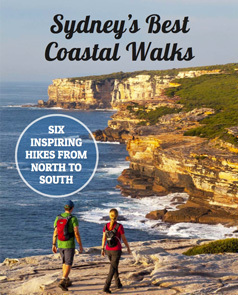 Even today, the only way to get there is by foot along the Coast Track on the Royal National Park Coastal Walk. There is no sewage, town water or electricity. The cabins are totally off-grid. Any rubbish generated must also be carried back out, so there are some interesting uses of recycled material. Once a year the cabins open to the public during the annual Cabins Open Day (usually in April). Families who have been connected to the cabins, sometimes for generations, share their personal cabin history. Colloquially, they're known as “shackies”, and boy do they have stories to tell! If you enjoy this, also check out photos of the largest cabin community at Era. This is Stop 8 on the Royal National Park Coastal Track Map. Tagged Cabins, History, Royal National Park.